A fascinating collection of stories, poems, essays and photos about femme identity in the lesbian community, written by femmes, former femmes, forever femmes, femme fatales, and admirers-of-femmes. Titles include: “Iron Fist in a Velvet Glove,” “Dyke on Heels,” “How to Tell if You’re a Femme: An Easy Quiz,” “The Care and Feeding of a Femme,” “A Femme in Butch Clothing,” and “A Butch in Femme Clothing.” Contributors include some of the finest lesbian writers in print today including Chrystos, Melinda Goodman, Chea Villaneuva, Tristan Taormino, Gerry Gomez Pearlberg, Kitty Tsui, Jess Wells, and Becky Birtha. When Sasha Alyson first invited me to edit a book about femmes, I was both flattered and insulted. Flattered because Mr. Alyson had confidence that I could take on such a project, and insulted because he prefaced his invitation with the question, “You do consider yourself a femme, don’t you?” I was indignant. How could he have even the slightest doubt? I racked my brain: had Sasha ever seen me without lipstick and heels? Finally I decided he asked me in order to be 100 percent sure, since—let’s face it—you just never know, and heaven help anyone who makes a femme faux pas. 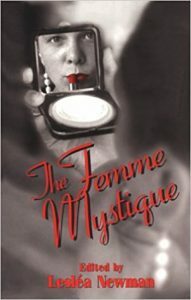 Even in the gay nineties, with lipstick lesbians reigning supreme, some women find it an insult to be called a femme. Not me, though. I am a femme and proud of it. It took me years to embrace the term, though when I think about it, I’ve always been a femme. My nickname as a little girl was “Diamond Lil” because I loved to play dress up with my grandmother’s costume jewelry. I would clomp around her apartment in a pair of her high heels, a matching evening bag hooked on my elbow, my little body adorned with all the rhinestones it could hold. Who cared if my grandmother’s clip-ons pinched my tender earlobes? I knew even then that beauty had its price. My grandmother would dab some perfume onto my wrists and some powder onto my cheeks, and there I was, a five-year-old femme fatale. Everything changed for me during adolescence, when my body began to blossom. Boys started to notice me and I didn’t like that one bit. For in addition to noticing my body, boys and men made it clear that my body was something they wanted. Somehow I had to make it just as clear that my body was not something I intended to give away. I did that by making myself as unfeminine as possible. I wore baggy jeans and shapeless sweaters or t-shirts. I did not use makeup or wear jewelry. My hair had no style at all and was in my face so much that, when I wore my tortoiseshell glasses, I looked like Cousin It of the Addams Family. This fashion-free phase lasted through the early days of my lesbianism (I came out when I was twenty-seven). I looked like your basic dyke—jeans, t-shirt, sneakers—the only difference being that I had long hair, which I cut immediately. Then I cried for an entire year while I waited for it to grow back. About this time, I went to a lesbian party and saw her, my first butch. I kept staring at this woman across the room from me, who was wearing white jeans, a black shirt, a man’s white jacket and a white tie. Needless to say, her hair was quite short (and perfectly combed). I kept thinking, what is a man doing at a lesbian party? And even though I was at that party to find a girlfriend, I couldn’t take my eyes off this person who I thought was of the male persuasion. Finally the butch took her jacket off and I saw that she had breasts. Then I really couldn’t look away. But I still didn’t realize that I was a femme, feeling an intense sexual attraction for a butch. I thought she was the ultimate lesbian and that I should try to look like her as much as possible. Of course this didn’t work: I looked ridiculous in a man’s jacket and tie. A femme trying to look like a butch is just that: a femme trying to look like a butch. When I finally realized that I didn’t want to be a butch, I wanted to sleep with a butch, a whole new world opened up before my eyes….